Jewelry artist Victoria Altepeter designs modern art metal jewelry that interprets the natural universe and tells a story in artistic snapshots, using metal and organic materials. Victoria Altepeter is a resident artist at the Arrowmont School of Art and Crafts, where she works on art projects, gallery exhibitions and teaches. Her art projects include metalwork for walls and jewelry. She completed graduate school at Arizona State University in 2009 and earned her Bachelor of Fine Arts from Northern Arizona University in 2005. In addition to the Arrowmont residency, Victoria sells her handcrafted modern art metal jewelry online at Etsy. Her jewelry collections include necklaces, earrings, rings, buckles and brooches in silver, gold, brass, bronze and copper. She also works with shibuichi and Mokume gane. 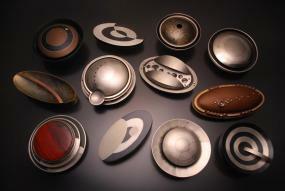 She uses metalsmith techniques such as keum boo and cold connection rivets to join metals and materials. Victoria Altepeter has a lifelong interest in ancient jewelry and adornment. She seeks to create jewelry that tells a story about people and their place in the universe, while also contemplating the beauty of natural objects. LoveToknow (LTK): When did you first become interested in jewelry design? At what point did you decide to pursue a career in jewelry designer? Victoria Altepeter (Altepeter): Growing up, I became very interested in ancient jewelry and adornment. It spoke so much for the individual wearing the adornment, and that was attractive to me, because I am from a big family. I have five younger brothers and sisters. At times you can feel invisible. The fact that these jewelry pieces could tell a story was and still is very special to me. LTK: What inspires you to design jewelry? 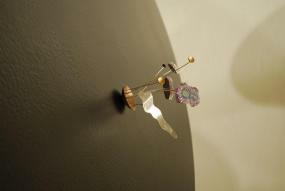 Altepeter: My inspiration for my metalwork usually comes from two places - outer space via the Hubble telescope and my own backyard. I am inspired by the ever shifting energy that makes up the universe, and our own world, and create snapshots of this constant change. Permanence is one of the most attractive qualities of metal...The preciousness and abilities of the material are equally inspiring for me. LTK: Please describe your other jewelry collections. What do the collections have in common? How do they differ? Altepeter: I think what all my work has in common is color, form and connection. Color is so important to me, I feel it sparks memory and is a major player in people relating to the work. I find patination so fulfilling because it is such a major change to the metals initial appearance. Cold connections are important to me because they harken back to simplicity. Human beings have been cold connecting metal and other materials for thousands and thousands of years. The forms I use in all my work relate to energy in its many stages of development - circles and ovals, ellipses, etc. I use these shapes as symbols for growth and development. I think all my collections, or series, differ in that they are all based on certain themes or ideas, and therefore the output is distinct. LTK: How do you how people will see your jewelry? Altepeter: I want people to see my metalwork and be inspired to wonder more often, to take time to stop and think, to remove themselves from reality for a moment. To think about the vast universe we are a part and ponder its beauty. There is so much beauty in the natural world around us, and I think with increasing technology and separation from our environment, people are forgetting how beautiful our world really is. I am so completely inspired by the little things - the microcosms - that are all around me when I hike a trail or snorkel the ocean. This coupled with the beauty of our universe on a grand scale is what I hope people begin to dream of when they see my work. LTK: Tell us about your Nebulae series, the concept and the type of designs involved. Altepeter: The Nebulae series came about because I was trying to find a way to create pieces of the same nature as previous, much larger wall pieces I completed in grad school. I wanted to create something with sparkle, with lots of color. Something that would push me to be more organic with line, but continue to be a tightly manipulated design. I found all the stones - stalactite slices from Uruguay - at the Tucson Gem Show in 2009. I had so much fun creating these! The concept is based on nebula or star factories. Nebulae are places in space that are very colorful and look like a dream. I enjoy the pictures of nebula because they are all so unique and attractive, and knowing it is a place where energy comes together to form something new is awe-inspiring. I had to create my version in metal! LTK: You collaborated with polymer clay artist Judy Belcher for the Exploring Connections exhibition at the Synergy II conference. What type of work did you create? Altepeter: It was a pleasure to work with Judy Belcher. We simply did what we do best and combined. Judy created intricate cane patterns and I used a hydraulically pressed piece of copper with patina. We designed the piece to look like matter in space. The idea of the expansiveness of the universe is really what the piece is about. LTK: Please describe your favorite piece of jewelry that you created and why. 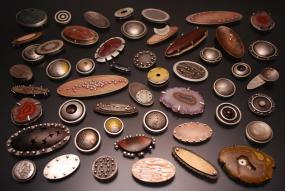 Altepeter: My most favorite series of work has been my Galactic brooches. 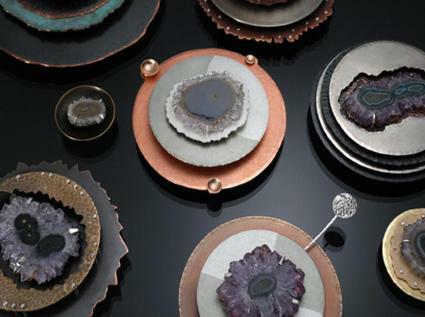 These are pieces of wearable art that mimic galaxies in space. I enjoyed working on them and I enjoyed watching them multiply. It was such a fun piece because I could mix up the techniques, the colors, the connections and the gemstones. They were entirely fabricated from scratch, one at a time, completely by hand. Some took several hours, some just a couple. I enjoy the small scale, and the way that you can wear multiples at once. People can find out more about Victoria Altepeter and her modern art metal jewelry at her blog and her Etsy store, where jewelry is for sale. She posts in her blog regularly about her jewelry and art.